This is one experience that literally made our hearts skip a beat as we took off from almost 8,000 ft with a view of the stunning Himachali landscape below us. Men have always dreamt of flying and unless you got superpowers, nothing comes close to flying than Paragliding. Given below is a comprehensive list of places for paragliding in India that is simply breathtaking in every way! Located in a small hamlet in Himachal Pradesh, Bir Billing is the go-to destination for serious paragliders and therefore, one of the best places for paragliding in India. Its claim to fame came when it hosted the Paragliding World Cup in 2015 and the sport has taken off since then, with thousands of adventure enthusiasts visiting this place from all over the world. Sitting pretty at an altitude of almost 6000 ft, Manali is another popular paragliding joint in the states of Himachal Pradesh. Except for the monsoons, the destination offers courses for Paragliding with stunning views of the valley around it. Therefore, it is one of the most popular paragliding destinations in the North. Another popular one in the North, Mussorie also offers the sport at competitive rates during the season with an altitude of around 7,400 ft. One can take off from the Lake and reach Dehradun in a long flight! This one’s located in Maharashtra, near Lonavla and offers tandem paragliding joy rides. Because of its landscape, Kamshet Paragliding Club is one of the most popular vendors there and boasts of having more than 20,000 fliers! Located in between Mumbai and Pune, you can reach here by bus or taxi. Experience the thrill of flying high up in the air with tandem paragliding at Nainital. Because of lots of operators and low prices, you can experience the serenity of the hills below from an altitude of over 4,000 ft. If you are looking at Paragliding spots near Chennai then head to the Yelagiri hills to experience this cool new adventure sport. The take-off height is approx 2,000 ft and Temple Pilots is the best operator there. Ranikhet is another popular paragliding destination near Nainital, therefore a great site for beginners. You can experience the joy of tandem flights or actually learn solo flying with trained instructors. Clear skies, favorable weather, stunning views of the hills, and the scenic valleys, makes this hill station a must visit place for paragliding. Flyers can make it to a soaring height of around 4,000 to 5,000ft and enjoy a bird’s-eye view of Panchgani. Solo jump or a tandem flight, Indrunag Dharamsala is a fantastic spot for paragliders offering spectacular sights of the golden sunset in the hills all around. 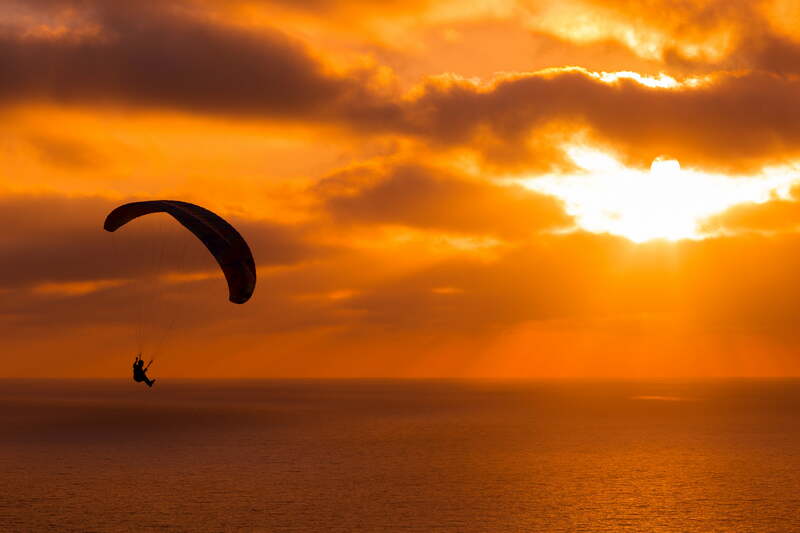 If you are not a trained glider, don’t worry, you can still partake in paragliding in the company of a professional. Kunjapuri provides a beautiful panoramic site for paragliding in the Shivalik hills and is located just 45 mins away from Rishikesh. Again the highlight of the flying experience is to witness the gorgeous sunrise and sunsets in the valley. Welcome to the world of paragliding in Sikkim where you can enjoy a Medium Flight (4,500 ft) or a High Flight (6,500 ft) with a landing site located 4 km from the jump spot. Baliman Dara and Bulbuley Dara are the only two certified paragliding take-off locations in East Sikkim (both are near Gangtok). A very off-beat destination giving you a marvelous view of the Kumaon district, Bedni Bugyal gives the ideal setting to Paragliding in Uttarakhand. The best time for Bedni Bugyal Paragliding season is September to May. The Scotland of the East, Meghalaya, has one of the Best Paragliding places in North East India. Thrill seekers can visit this beautiful destination to have the best experience of paragliding in the scenic surroundings. How about enjoying a bird’s-eye view of Goa and the surrounding seas? Try a hand at paragliding in Arambol Beach and you are sure a see a different view of Goa from up above! The flight starts from a cliff located between Arambol and Harmal beach, and you take off to a wonderful view of the mountains, plains and the ocean below. One of the most breathtaking regions in the hills of Uttaranchal is Pithoragarh that offers hang gliding, paragliding, trekking, skiing, canoeing, river rafting, and fishing. You can experience the beauty of the Sanasar valley by flying over its beautiful landscapes full of meadows and lakes. A low flying ride here includes a larger bit of the flight path over a lake and a landing into the meadows and a high-flying ride can be experienced from Nathatop for a duration of about 20 minutes. A beautiful hill station in Kerala, full of lush green meadows, hills, waterfalls, and rivulets, Vagamon is an upcoming Paragliding destination in the South offering jumps from an altitude of 4,000 ft. All you need to do is have the courage to fly to the hills of Kolahalamedu, a part of South India‘s second largest peak ‘Amruthamedu’ and enjoy the thrilling journey! Pavagadh Hill is situated within a plain in Gujarat in the southern Aravalli Range. The flight distance is about 3 km and lasts 20 minutes. Because private vehicles not being allowed in, registered buses and government vehicles provide transportation up the hill and to the take-off point. An ecotourism destination, Matheran is also a great paragliding spot located in the Sahyadris. Matheran is a calm and unpolluted place, an ecozone. Therefore no vehicles are permitted inside the town and because of this, it is a lovely place to go paragliding. Grab your chance to fly over the Pink City because the sport has gained a lot of interest in Rajasthan. View the surrounding hills or witness a charismatic sunset over the desert as you soar the skies over the rustic, historic city. This one is located just 45 km from Pune and set in the Purandar Fort. What makes this place ideal for paragliding is that the entire region is composed of a lot of open fields because of which take off and landing is an easy affair. Quite an unusual paragliding destination, but Bhopal features in our list because the city is now pushing it as an adventure sports destination. You can book your flight with Singh’s Paragliding and Paramotoring. They offer paragliding courses and tandem joy rides in Bhopal. Apart from paragliding in India, if you are looking for other adventure activities, why not try the trek to Mount Kailash? Here are some great trekking tips as well. Hey Sachin. Thank you for reading the post and leaving your comments!! Do subscribe and share with your friends as well. Have a good night!